See the description of our two other Hutchinson rugs for more info on the couple. 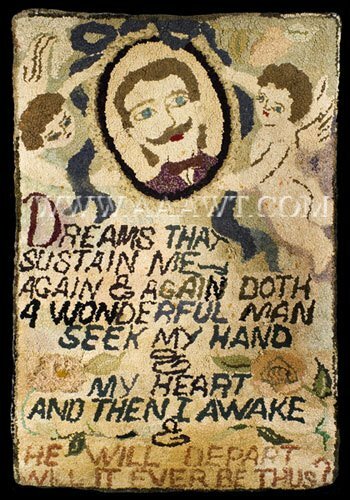 Severa; examples of their work appear in Folk Art Underfoot by Kate and Joel Kopp. These are few and far between. I have always wanted to a a catalogue raisonee of all the phrases that they incorporated in their rugs to see if they make a complete short story, but it is unknown where others may be.